We really wanted this week’s Fail to work. [Michael] wanted more juice for his Nikon D3100 camera. The idea he had was to replace the cells of the battery with a Buck converter and add leads for an external battery. This opens up the possibility of running from a wide range of voltage sources; an attractive prospect for devices using specialize batteries. Specifically, he wanted to swap out the stock 7.4V 1030 mAh battery and use an 18 Ah lead acid one instead. The biggest hurdle to get over in a project like this one is the logic the camera uses to communicate with the battery. For this reason — and for the ease of hitting the right form factor — he scrapped an old battery pack to reuse the logic board and enclosure. His power supply is a free-formed circuit which fits nicely in the allotted space. The circuit powers up, but only to about 6.4V. This isn’t enough to run the camera, which means this was just an expensive way for [Michael] to practice his soldering. After the jump you can read his recounting of the experience. You’ll also find a few of the build images, and the two hand-drawn schematics he used during development. His Dropbox has the entire collection of images. [Erich] spotted a broken DVD recorder at a local amateur radio meeting and decided to see if he could restore it to working order. While he was fortunate enough that someone labeled it as having a bad power supply, things aren’t always that easy. He gives a broad explanation as to how switched mode power supplies work as well as discusses some of the reasons these devices tend to fail. He identifies a few common components and areas that one should check while diagnosing a non-functioning power supply. 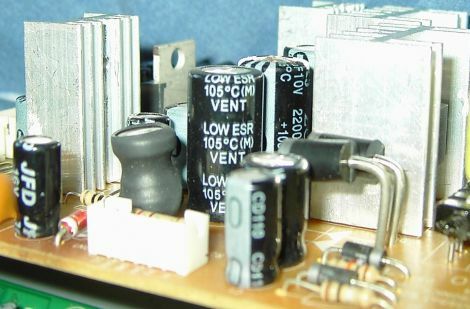 While obvious bulging capacitors are easily identifiable, he discusses the need for an ESR meter and uses a kit-built model to test capacitors that do not have any visual signs of damage. While some of his walkthrough might be basic knowledge for readers who have experience in recapping circuit boards, it serves as a nice guide for those who are new to the world of electronics troubleshooting and repair. [Ken] needed to supply 3.3 volts of regulated power. He started by using a linear voltage regulator but after a few calculations he discovered that 72% of what he put in was lost to heat. The solution to this is a switched-mode power supply. Rather than burn off energy through a voltage divider, an SMPS turns the power on and off very quickly to achieve the desired voltage. A car charger-type USB regulator was chosen as [Ken’s] donor device. He figured that making adjustments to the resistors inside would affect the output voltage and he was right. He adjusted the potential divider and ended up with a steady 3.295V.